Ever peek into the space beneath your sink, or search deep within a kitchen drawer, only to find a cluster of dozens, even hundreds, of bunched-up plastic bags? “How did they get here,” you think, “and did they reproduce while I wasn’t looking?” Maybe you occasionally re-use these plastic bags as makeshift wastebasket liners, or to tote small items from place to place, but your usage cannot possibly keep pace with their speedy accumulation. Perhaps you’d feel guilty throwing them straight into the garbage, especially after only one use. And you really don’t know how to recycle them, since your township’s recycling instructions for plastic bags may be unclear. Plus, they seem like they’ll come in handy again someday. So you shove them out of sight. That explains the unruly bag stash – dwarfed only by your other huge pile, the single socks from the washer, for which you still, someday, hope to find mates. It’s not easy to know what to do with used plastic bags, or what happens to them when they leave your hands. Overall, everything about plastic bags’ post-use afterlife seems unclear and misunderstood. 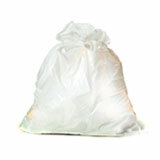 So, with this post, we will take a look into the process of recycling and reusing plastic bags. It’s a myth that all types of plastic are both a) recyclable and b) routinely recycled by society. In reality, only two types of plastic are typically recycled (PET and HDPE), and neither type is in plastic bags. 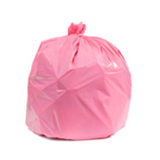 Though the type of plastic used in bags is recyclable, very few curbside recycling programs accept plastic bags: the truth is that recycling plastic bags is a challenging task. 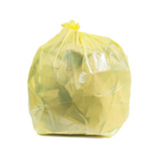 “Plastic bags cause problems in all our operations,” says a recycling program spokesman. 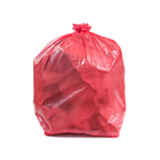 Bag collection, sorting, cleaning, and quality-control are costly for recycling plants. In addition, bags tend to clog recycling facility machines, and “wrap around and jam recycling equipment.” So when consumers drop plastic bags off at curbside recycling bins, they may do more harm than good. 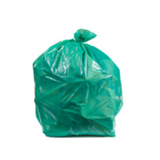 Instead of being recycled, the bags only clog up machinery or escape into the environment. Though some cities do offer bag pick-up programs, in general, consumers can only recycle plastic bags at supermarkets with specific plastic bag recycling programs. For example, New York State requires stores to establish in-store bag recycling programs. 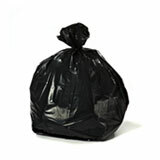 You can search this site to find bag drop-offs nationwide. This helpful guide also explains what type of plastic your bag is made of, and the recycling rules associated with it. For consumers, re-using plastic bags – even if they were only used once – carries danger of contamination. A 2014 study by Professor Anthony Hilton examined survival rates of bacteria on single-use plastic bags (and other types of bags). The findings: Staphylococcus aureus survived 8 to 16 weeks, while the fearsome E coli survived for 48 hours. In addition, 23% of bacteria on plastic bags can be transferred to hands in a single touch. Disturbingly, another study found that 97% of shoppers don’t wash plastic bags – in fact, it never even occurs to them to do so – increasing the risk of foodborne illnesses. The good news? Washing bags reduces bacterial levels to almost nothing. Nevertheless, this study certainly casts an ominous light on the clusters of plastic grocery bags multiplying in every home! So what happens to plastic bags when they are successfully recycled – that is, when they do find their way to a supermarket recycling program, for example, and are picked up? The answer is a bit controversial. 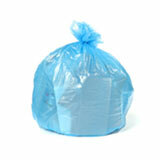 The following video shows the recycling process for a plastic bag. 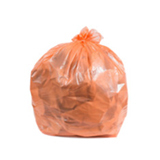 In short: old plastic bags are liquefied in a machine; the liquid plastic is blown into a tube, flattened, and rolled into film; and this film is turned into new, recyclable bags. Truly a virtuous “cradle-to-cradle” cycle! However, this process has its downfalls. Critics charge that bottles are the only plastic product expressly manufactured for recyclability, and that other plastics are too difficult to recycle. 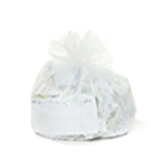 For example, plastic bags must be clean and contamination-free to undergo the above recycling process – but as mentioned, used bags are often contaminated. Bags not recycled into new bags are either turned into composite lumber – a wood/plastic combo often used in outdoor decks – or sent to the export market, where their journey often leads to the Far East. According to the American Chemistry Council, in 2008, 29% of post-consumer plastic bags and film became composite lumber, while 57% went to the export market. But critics maintain that contaminated plastic is only viable in foreign regions because clean-air laws don’t exist. Trex, a decking manufacturer that partners with commercial recycling programs, puts an inspiring face on plastic re-use: “Your plastic waste can be a golden opportunity.” And, referring to its cash payout for otherwise unwanted plastic bags: “Make some green by going green.” This perspective puts a happier spin on the storied afterlife of a single-use plastic bag. Ever guess the bag that carried home your bananas would someday end up as your patio? This entry was posted in Plasticplace by PlasticPlace.